Recently, China has used their small space station to perform experiments that appear to prove the EM drive works. Ironically, this may both help and hurt New Space and space settlement efforts, because it can dramatically change the playing field for the companies entering this “blue ocean”. EM Drive is a simple design that may allow tiny amounts of thrust to come from an electronic device with only electricity put into the system. Since EM drives use no propellant, they could propel a spacecraft, slightly but indefinitely, for as along as they have access to electricity. If these preliminary results are correct, an EM drive is roughly a tenth as powerful as an ion drive system in converting electricity to thrust. Ion drives use a combination of electricity and propellant to be super-efficient but very weak. The most advanced ion drive systems produce as much pressure as the weight of a piece of paper resting on your hand. EM drive is more like a post-it note. The effect is so slight that there is much controversy as to if the drives work at all. Another similar system will be tested in orbit by a private firm in the coming years, and NASA has recently had a paper peer-reviewed that demonstrated a slight thrust level. 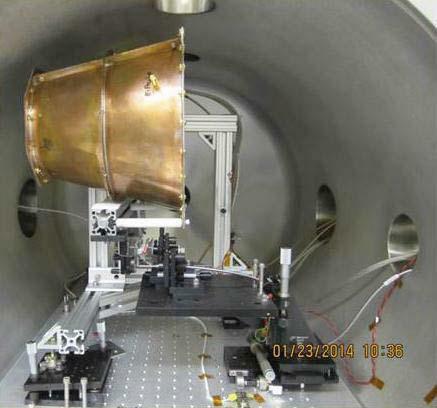 While this is incredibly weak, there are several applications for such a low-thrust system. Now the Chinese are planning to build station-keeping thrusters for satellites using this propellant-free technology. A smaller nuclear power source (RTG) would allow complex robotic missions to the outer solar system in our lifetimes, such as an orbiter of Pluto or exploration of similar, more distant worlds. A solar-powered version could explore the asteroid belt indefinitely. An advanced reactor-powered vehicle could travel deep into the Oort cloud in a few decades. If the engines can be made more powerful, we may see the beginnings of robotic starships in decades rather than a century from now. A communications satellite with EM Drive for station-keeping would be able to stay on site until the electronics were burned out or obsolete. While it would require more electricity, it would be able to devote more of its mass to higher capacity, higher reliability electronics. Many people are shocked to learn that we went from Kitty Hawk to Apollo 11 in only 66 years, and doubly so when they then realize we've done nothing as amazing in the subsequent five decades. Had aerospace technology continued to advance exponentially, we would have approached the speed of light by the year 1990. Within a 12-month period in 1969-1970, we saw Apollo 11, the first Boeing 747 flight, the first Concorde flight, and the first Harrier flight. Note that none of these vehicles were surpassed for decades, and two have not been surpassed at all. It wasn’t just the space program, it was all of aerospace that suddenly went from exponential growth to a flat, slow pattern of development, if not relapse. So, what happened? Just as great technological revolutions happen at the convergence of events, so great collapses of industries also happen at convergences. 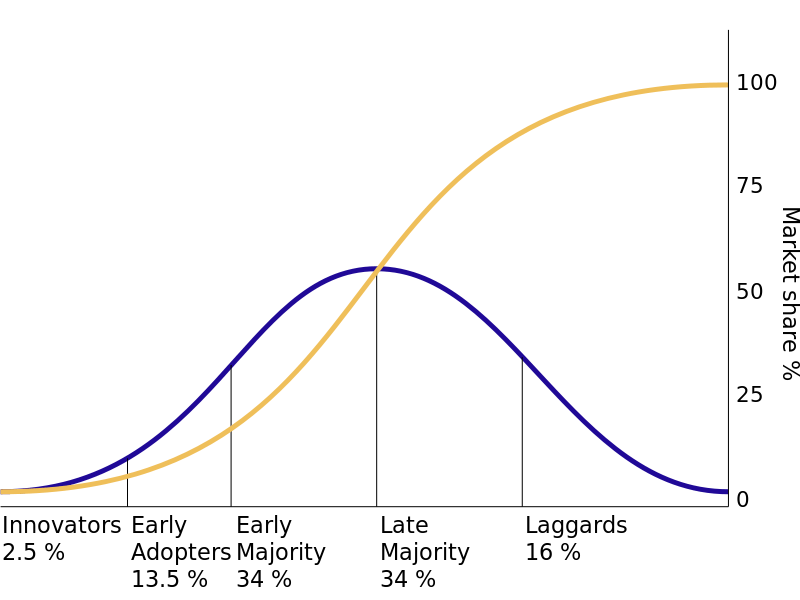 The Diffusion of Innovations Curve – A great innovation generally has an explosion of interest and adoption, followed by a slow “normalization” into becoming a cheap commodity (if successful) or collapse (if simply a fad). Once it reaches either level, there is no further drive to invest heavily in the technology’s development. Money will find another place to go. To those living through these transitions, the growth appears exponential at first, then suddenly and unexpectedly flattens out just when it seems there is no limit. Low Hanging Fruit – All four aerospace examples hit the practical physical limits of what could be done with the technologies and materials at the time. The first billion dollars in investment got aerospace into an incredible expansion over the first few decades. The next billion in 1970 would have led to only incremental advancements in launch vehicles and jet engines. With airliners, the economic drive then was shifted from power to efficiency. Commercial jets are slightly slower now than they were in 1970, but much more fuel efficient and therefore affordable to the flying public. The space shuttle was also meant to be an economic move, but one that failed to produce a lower cost system than the ones that preceded it. The Microchip Revolution – Around the time we hit the upper limits of what could be practically launched with recycled and expanded missile technology (10-20 metric tons), we also had the start of the diffusion of innovations curve with the microchips. Suddenly, you didn’t need a rocket that could launch twice as much payload two years later to double capacity. You needed the same rocket and a satellite in the early days of Moore’s Law. The emphasis in investment shifted to better satellites of the same mass. The price of launch vehicles had no reason to drop or become more efficient, because the satellite technology itself was driving growth by picking the low hanging fruit of a different technology. Money always flows toward the low hanging fruit. We went from billions in new aerospace research to billions in new microchip research. This lead to waves of software, internet, and mobile technology over the coming decades. Satellite launchers became more reliable but not more affordable with experience. As the satellites became more economically valuable, there was no incentive to reduce launch costs or improve capacity. There was a disincentive to innovate, because changes bring new risks as the new technologies are proven out. These combinations flattened the aerospace innovation curve dramatically. Rocket technology stagnated for over four decades. It was ripe for disruption by Space-X when they began to dramatically undercut competition in launch price. Meanwhile, back at microchips, Intel is now taking 50 percent longer to deliver growth than it has in the past. There are still revolutions to be had in computer technology, but they are at the very cheap end (Internet of Things, self-driving cars) and the very high end (quantum computing). There are low profit margins in technology that is too cheap to demand high margins or too expensive to demand large markets. This may slowly free up money looking for a crop of low-hanging fruit. It is quite possible that the torch that passed from aerospace to microprocessors in 1970 will be passed back, to some extent, over the next decade. A combination of heavier launch, cheaper launch, and on-orbit refueling would enable larger, more mass-efficient communications satellites. Cheaper and more frequent launch can put thousands of small communications satellites in mid-altitude orbits. If proven, EM drive is an unexpected bonus for this business plan. It provides an efficiency gain and lifespan extension to all these satellites, large and small. Every new enterprise requires up-front investment to get to what is known as Minimum Viable Product, or MVP. The purpose of this product is to start turning start-up costs into revenues and begin the recovery of investment. Once the company hits break-even, the product should go on to fund a more advanced replacement product. Asteroid mining companies, Planetary Resources and Deep Space Industries, have a common business plan. 1 – Fly private exploration and sample return missions and sell the data/samples to NASA, who can benefit from “discounted” science data. This is a very small market (government space agencies), who also have their own exploration priorities. As a preliminary estimate, assume a very small market with very limited growth potential. 2 – Mine asteroids for water, convert it to rocket fuel, and use it to supply commercial satellites in GEO. This would extend the lifetime (and payback investment) on communications satellites. Originally, this was assumed to be a growth industry. Communications satellites for television alone have ten times the revenue of all the government space program budgets worldwide, combined. But first, there must be propellant to provide. Satellites tend to use storable propellant, but hydrogen/oxygen from asteroids is not particularly storable. Any communications satellite would use fuel that can be stable for over a decade like hypergolic propellant, not cryogenic or even storable cold propellants like methane. There are concepts for using superheated steam as propellant, but that wouldn’t necessarily be competitive with ion drive. It certainly wouldn’t be competitive with EM drive. 3 – Return platinum group metals to Earth from metallic asteroids. These metals are very valuable and rare on earth, but can be mined from certain metallic asteroids. Advanced up-front costs, and commodity-level prices, mean the system must be very large (and expensive) to provide a return on investment. One application that drives the need for platinum in the current economy is the demand for catalytic converters used on all modern cars and trucks. These are expensive because they require platinum as a catalyst, though the metal can be recycled. This demand may shrink as electric cars become more common. Reduced demand lowers prices for platinum, and makes going into space to look for more resources less viable. 4 – Provide materials and propellants for human space exploration and settlement. Crewed spacecraft beyond Earth Orbit would had a massive need for propellant. That said, Space-X has a massive, affordable, ground-launched tanker in their design model. Such a vehicle would not rely on an outside company for propellant, and such a company would have to provide propellant at a competitive discount to have a customer at all. Blue Origin and ULA vehicles (Vulcan and ACES) would be a strong market eventually. ACES is designed to use water-based propellants (hydrogen and oxygen). New Glenn and New Armstrong would be propane/oxygen systems, but could still use oxygen mined from asteroids (which is the bulk of propellant mass in most rocket systems). The asteroid mining business model is threatened at all four market points over its planned expansion phase. That said, not all news is bad. Expanded Asteroid Surveys: EM Drive would make it viable to survey many, many more asteroids for resources with much lower budgets. The existing model would send tiny fleets of satellites past individual near-earth asteroids to look for resources. If the where found, another set of dedicated satellites would do the actual mining and recovery. The problem for asteroid mining companies is that they must send a lot of small, disposable space probes up to get anything back – data, surveys, or resources. These probes would cost millions of dollars per mission. If each mini-probe had an EM drive, it could survey multiple asteroids, and therefore amortize the investment over a larger resource survey. Again, selling data to NASA could become more profitable, and extend to university scientists for targeted investigations. It becomes a growth industry within academia, the same way cubesats have reduced the cost of satellite research to reach academic markets. No Return Costs: Vehicles with EM drives could also return materials, including propellant, back to Earth without using that propellant in the process. This would take a lot more patience than ion drives, but would have the benefit of not needing to be refueled themselves. More vehicles with lower thrust to return the same payload mass in the same amount of time means more small tanker spacecraft, but a higher return on investment per micro-tanker. Mass production would lower costs further, and would allow smaller payloads to specific clients anywhere in the inner solar system. Expanded Crew Demand: EM Drives are fine for reducing the need for propellant, but cannot reduce the need for water, oxygen, and other resources for crews and construction. That would free more space-harvested resources to be used in bases and early settlements by human beings. Halo Effect: EM Drives could increase interest in space settlement by the public. This, coupled with reusable rockets and complex missions beyond earth orbit, could draw investment to an industry that hasn’t captured the public’s imagination recently. As we approach the practical limits of microchip design, the computer industry is now beginning the curve that slowed in aerospace in 1970. The $1 billion plus investment required for each new generation of processors may reach a law of diminishing returns. Some percentage of that money may want to go back to aerospace. If embryonic space settlement companies can adapt to this new environment quickly, they may yet become prosperous. While EM drive would disrupt an already-disruptive technology in New Space, it would eventually enable a broader market with greater investment, and greater return on investment, than originally planned. Please sign up for updates on new MacroInvent content, projects, and news. If you want to get involved in MacroInvent in the future as we expand our team, please tell us in the Areas of Interest box, below.